Home » Hand Tools » Sockets & Ratchets » M10 IMPACT HEX BIT SOCKET 3/4"DR. Bits are made of protanium torque steel. Socket base is made of CR-MO. Bits are replaceable with Bondhus Spare Bits for Impact Hex/Torx Bit Sockets. 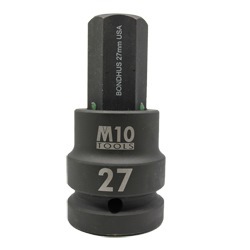 M10 IMPACT HEX BIT SOCKET 3/4"DR. Bits are made of protanium torque steel. Socket base is made of CR-MO. Bits are replaceable with Bondhus Spare Bits for Impact Hex/Torx Bit Sockets.